Every year we have a tradition in the Forto house where we celebrate the greatest month of the year, October, with scare your socks off, hide under the covers, turn on all the lights, sleep with one eye open, fright fest, movie marathon everynight of the month! We call it 31 Days of Horror. My wife bought me a collection of videos called 50 Chilling Classics. They appear to be public domain films and most of them have appeared on Elvira’s Movie Macabre. Tonight’s movie is sure to be an instant favorite (not!). It is a 70s made-for-tv movie: Snowbeast. It was made just two years after JAWS and is almost a direct knock off from the spooky big-fish movie except this time it is on the slopes of colorful Colorado. It is a beautiful little B-movie. Well maybe I am giving it a little too much credit. Maybe a solid C. There just is not enough Yeti to make it suspenseful enough for my tastes. 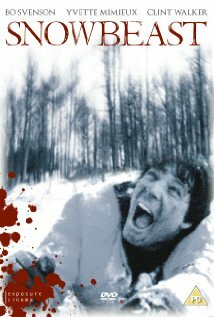 Sure any movie with a man running around in a Bigfoot costume is designed to not only bring some chills but some laughs as well. In one scene the yeti’s shadow crosses to the left but all the sudden his arm comes through the window to the right. Look at it this way… We still have 49 chilling classics to watch. I am sure to find a gem in that rough!